American Corners Macedonia - the NEWS: Columbus Day Crafts! 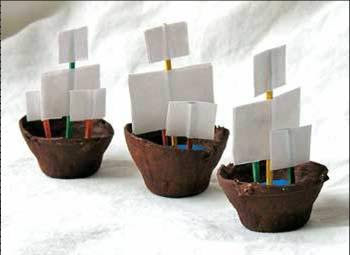 This Columbus Day, make your vary own mini versions of the Nina, Pinta, and the Santa Maria! This fun recycle project is easy to put together and great for a classroom activity. Paint the egg cups inside and out with brown paint. Set aside to dry. Set aside three of the toothpicks for the large sails. Break or cut the other three toothpicks in half, giving you 6 halves. Put a line of glue through the middle of one of the small sails. Place the cut or broken end of one of the toothpick halves onto the glue line. Roll it in the glue to cover both sides, then place another sail on top, sandwiching the two sails together. Flatten the sails together with your fingers and set aside to dry. Repeat step number 5 with each toothpick half and 2 small sails (each). Following the guide in step number 5, make the larger salls. For each large sail you will need a toothpick, 2 small sails and 2 large sails. Glue the small sail to the end of the full toothpick, and then glue the larger sail beneath it, leaving a small gap between the top and bottom sail. Set aside to dry. Roll a small amount of clay in your palm, enough to line the bottom of the egg cup. Place in the egg cup and flatten to cover bottom. Insert open end of large sail into the middle of the clay. Insert two small sails, one on either side of the large sail, into the clay. Happy 5th Anniversary American Corner Bitola!!! !